Gordon Fee's new book, Pauline Christology: An Exegetical-Theological Study is now available (at least through the Regent Bookstore). Matthew Montonini has sample pages from the book available at his blog. Seeing that there is no time in the foreseeable future that I'll be able to read this, I'm anxious to hear the conversations and reviews. For everything else Gordon Fee you can imagine (including tons of great audio resources), checkout Gordon Fee Online. For those that haven't guessed, the reason my blog has been on life support for the past many months is that I'm finally in the writing stage of my thesis. If you're at all curious what I've been immersing myself in, or, more importantly, curious to deepen your understanding of Barth's theology, you can read a draft chapter on Barth's doctrine of election and the visibility of God that Paul Helm has graciously made available on his blog. The chapter is part of a forthcoming book from Apollos, Karl Barth’s Theology: Collected Critical Perspectives, edd. David Gibson and Daniel Strange. Helm's chapter provides a great analysis of Barth's critique of Reformed theology as well as a critique (which I share) of Barth's own problem of God's visibility in his renovation of the classic doctrine of election. Crossway has just re-published Sam Storms' book, Chosen for Life: The Case for Divine Election. This is not only the first book on election that I read, but it is one of the first theological books I ever read-- and the impact of this book on my life could scarcely be over-stated (which, I realize, for someone given to over-statement, this is a bold claim). ...a revised and greatly expanded version of the earlier work. This edition of Chosen is approximately two-thirds longer than the first one, with new material on James Arminius, the nature of Arminianism (specifically, prevenient grace, the nature of God’s will, and its view of Romans 9), more extensive analysis of the relevant biblical texts (especially John 10, John 17, Ephesians 1, and Romans 9), together with new insights from Calvin, Edwards (on both election and total depravity), and Spurgeon, among others. There is also a completely new chapter addressing the question of why didn’t God choose everyone to be saved, as well as two new Appendices on praying for the lost and the order of the divine decrees. 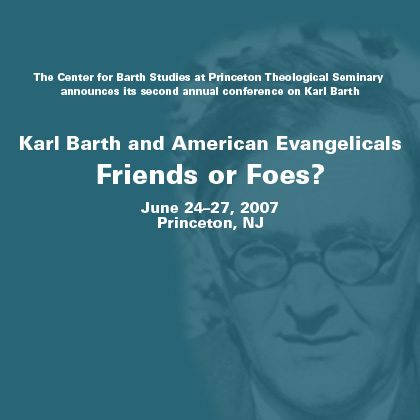 Karl Barth & American Evangelicals: Friends or Foes? After having an extended discussion with a friend last week regarding the issue of gender roles and biblical interpretation, I have loved the opportunity to revisit many of the crucial questions regarding manhood & womanhood as well as to read the timely thread on the issue at reformation21 blog. Below is a quote from Rick Phillips', Understandably Feminist along with links to the current posts in their series. While I do not believe that patriarchy (biblically defined) is a sin, as Stackhouse claims, I do believe that many women have never experienced biblical patriarchy but only a mockery of it. In other words, however big the feminist problem is in America and in the church, I believe there is a masculinity problem that is just as big, if not bigger. Given the attitude of many men towards their wives and daughters, and given the actual behavior of many men (in and out of the church), it is no wonder that women fear male authority structures. Sufjan explains that a lot of his friends have recently converted. "I think there's a renaissance of people just wanting to be part of the greater universal Church and putting aside all their qualms about it." So what stops him? "There's a fear that I have of the authority of Catholicism, the cardinals, the bishops, the pope. I feel that nobody should have that much control."